If you’re the type of baseball fan who likes to read baseball books, chances are you’ve read a “diary of a season” book. They don’t all cover just one season, of course, and no matter the time frame covered, there’s always significant back story for a set up. Whether it’s Moneyball, Big Data Baseball, Feeding the Monster, or numerous others, it’s a pretty robust subgenre of baseball books. Rare is the “diary” book however, where the author(s) are also the principals involved in the story. That is just we have in The Only Rule Is It Has To Work, as storytellers Ben Lindbergh and Sam Miller are also the chief architects of said story. 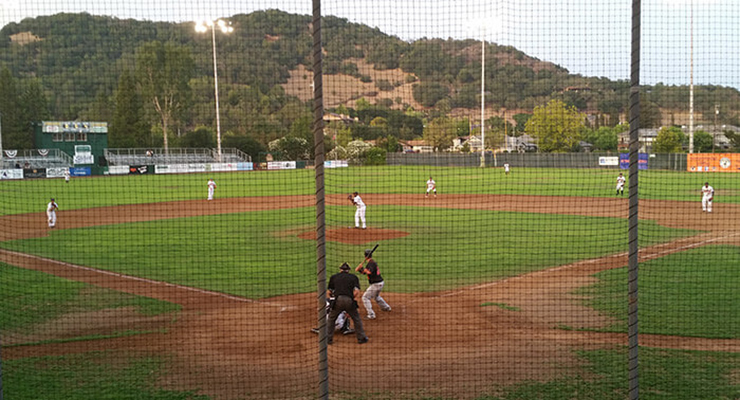 The story is this — Lindbergh and Miller were given the keys to the Sonoma Stompers, a team in the Pacific Association located in California’s wine country, for the 2015 season. The pair were given authority to do whatever they wanted, and worked in tandem with Stompers’ GM Theo Fightmaster to see their plans come to fruition. (Side note: Throughout most of the book, Fightmaster is simply referred to as “Theo,” which was disappointing because every time you see the word “Fightmaster,” you just want to scream “FIGHT-MASTER!! !” It’s just the best name.) It was an ambitious plan, especially for two writers whose managerial experience was mainly internet-based. David is a left-handed batter, and he’ll be facing our right-handed pitchers. Against right-handed pitchers, he has a .440 batting average when he hits a ground ball. That’s the highest success rate on his team, more than double the league’s average. He also hits ground balls more frequently than anybody on his team, and he sprays those ground balls all over the field, so we can’t possibly defend every hole. Even worse, his signature hit is a shallow grounder that the shortstop or third baseman charges but can’t transfer fast enough to beat him to first. If we had five men in the infield, we’d plug more of those infield holes, while also allowing everybody to play a couple of steps in and field his choppers more quickly. While there are plenty of statistical tangents, this is a book about people. 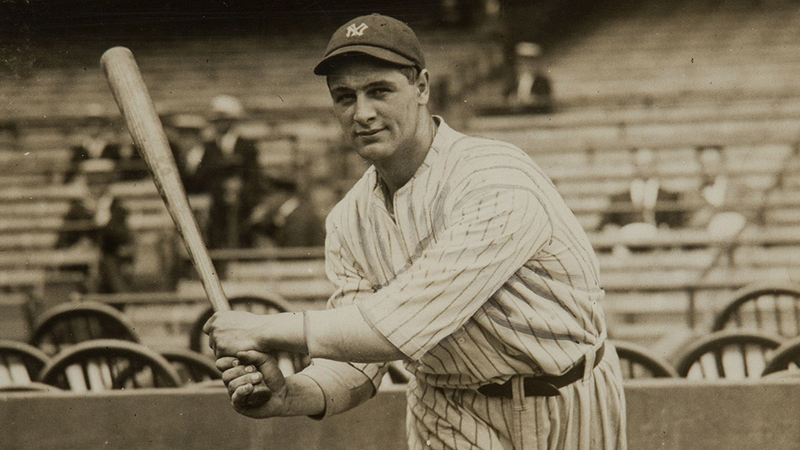 Certainly, some of those players we meet through spreadsheets that baseball analysts like Chris Long, John Choiniere and Hans Van Slooten help Lindbergh and Miller develop, but they rapidly evolve beyond statistical fragments. Take Taylor Eads, who signs with the team midseason. Lindbergh pines to sign him for a good chunk of the season. He finally does land the outfielder, but when Eads has a rough first couple of games, he is chided for signing him, and it makes every opportunity for Eads feel incredibly important. “The stakes are so high that the rest of the game feels like filler,” Lindbergh writes. The man doing the chiding is perhaps the biggest personality in the book — manager Fehlandt Lentini. If this book has a villain, it’s Lentini. Nicknamed “Ferrari Lamborghini” by former teammates not for his taste in cars but rather a “high-performance temper,” Lentini is not shy about confrontation, and few people — be they umpires, players or Lindbergh and Miller — escape his tirades. While the authors are emphatic about how much they learn from Lentini, and there are numerous situations where his judgment — antagonistic though it may be — is sound, the manager is often portrayed as a lunatic. Or at the very least, incredibly stubborn. There are plenty of other important figures in the book. Perhaps the most important is pitcher Sean Conroy. He hits on all the points you’d want in a book character. He’s the team’s best pitcher, and his usage is a flash point. At times he is a fireman, at times a one-inning closer and at times a starting pitcher. How he goes from one role to the next is among the more intriguing subplots. But he’s also an inspirational figure, as he becomes a trailblazer as a gay man playing pro baseball. Once he comes out, his story becomes national news, and readers have a front row seat into his journey and how it affects the team dynamics. This is just the tip of the iceberg. From bearded catcher Isaac Wenrich to playing at San Quentin prison to trying to set up the PITCHf/x system in an independent league ballpark to the league’s 1981-esque playoff structure to signing Jose Canseco as a promotional stunt to the crushing elation/depression when the team’s best players are signed away by teams in better leagues, the book is chock full of unique stories. It’s not just the story they’re telling that’s unique, it’s the way they tell it. This is a rare sports book that has two active authors. Generally, when you see two authors for a sports book, it’s a famous athlete and a sportswriter, and the latter is doing all the writing in the voice of the former. That’s not the case here. Instead, Lindbergh and Miller trade off chapters, which sounds like it might be awkward, but works incredibly well. While you might think of Lindbergh and Miller as peas in a pod, thanks to all the time they have spent podcasting and working together, they still have unique voices and perspectives. And throughout the book, the two of them have their own tension at times, and the reader is able to see both sides of that. Moreover, having them trade off chapters means that the book doesn’t necessarily progress linearly. The timeline shifts at points, and crucial details are traded off. The effect that’s created is one where you don’t know what’s coming next, even if you know what’s coming last. This makes for a more exciting read, and as such it doesn’t sag in the middle like it could have. 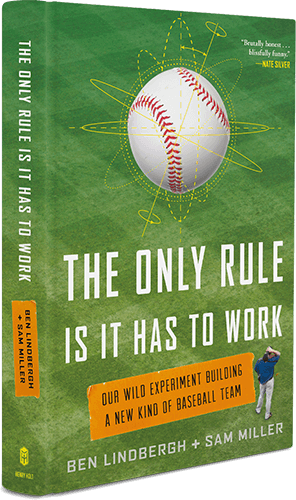 The Only Rule Is It Has to Work sounded like it would be a book that would document all the crazy things you could do on a baseball diamond. And while at times it did, it was more a story about loving baseball. As the authors note in the book’s acknowledgments, there is no wrong way to love the game, and this book drives that point home thoroughly and unflinchingly. Amazon package arrives today. After that review I’m now looking forward to reading this book even more. Bought the book last night and couldn’t put it down. I’m a slow reader but already on page 90! It’s everything I anticipated and more. So… … did David hit a blooper where the missing outfielder should have been and get an IPHR or did he strike out trying to change his swing because of the 5-man infield?